IF YOU DREAM IT, WE’LL MAKE IT HAPPEN! Located on a picturesque property in the foothills of the Adirondack Mountains, the Paul Nigra Center for Creative Arts is a multi-use, state-of-the-art facility that presents cultural enrichment opportunities at every turn. We are proud to offer elegant and professional venues for individuals, groups and businesses to host meetings, conferences, retreats and special events ranging from bridal and baby showers to anniversary and sweet 16 parties. The entire building can also be rented for very large gatherings. It is accessible on weekdays, evenings and weekends based on availability. The Nigra Arts Center is here to meet your venue needs, no matter what they are. Let us help you customize your perfect event. We look forward to working with you to plan your special day and create a truly memorable experience. The Grand Gallery is perfect for conferences, trainings, meetings, team building exercises, small weddings, receptions, art shows, musical and theater performances, showers, anniversary parties and other activities that require a large, unique space. Includes a projector and screen and sound system if needed. Round Tables: 75-100 people max. Stadium Seating: 125-150 people max. $350-$1,500 TBD depending on the needs of client. This price includes the use of the kitchen. The Tamarack Conference Room features large tables and screens ideally suited for meetings, trainings and smaller gatherings. Includes a projector and screen. Conference calling and Zoom meeting connections are available for an additional fee. Room for two additional tables in front. $250-$350 TBD depending on the needs of the client. Evening/weekend rates apply. The Granite Conference Room is ideal for meetings, trainings and smaller gatherings. Includes a computer, projector and screen. $125-$225 TBD depending on the needs of the client. Evening/weekend rates apply. A small dining area perfectly suited for a family gathering or buffet serving of luncheons or dinners during conferences and meetings. The teaching kitchen includes appliances and stainless steel tables for demonstrations and workspaces. It is available to rent individually, but it may also be used in connection with other rentals for an additional fee. It is a great space for team building projects! $125 per hour. Evening/weekend rates apply. The entire Paul Nigra Center for Creative Arts may be rented for large events, including fundraisers, catered meals, receptions and more. $1,000 TBD depending on the needs of the client. Evening/weekend rates apply. Audio/Visual Support | A fee may be required if staff assistance/set up for audio/visual systems is required. Rate to be determined and agreed upon by both parties based on the needs of the client. Linen Rental | If the client chooses to use cloth tablecloths/napkins, they will be available for market rate. The client has the option to provide their own linens. Service Fee | If the client chooses a caterer that does not provide service staff, additional fees will apply for the Nigra Arts Center to provide service staff. Evening/weekend rates apply. Maintenance Fee | Client is responsible for removal of debris (outside of what fits in garbage cans). There will be a fee deducted from the security deposit if additional maintenance is required to remove excess trash. Evening/Weekend rates apply. Security Deposit | A $100 refundable security deposit is required at the time of booking. This will be used toward the event balance. Equipment Rental | If there are extra items needed for events, we may have them. Please check our Equipment Rental list for further details. Because of the uniqueness of the facility and art collections throughout, the Nigra Arts Center does not allow any activity or event that may result in damage or disturbance to the collections or the building. We ask that children under 12 are supervised by adults in the art gallery. The Nigra Arts Center controls the use and location of props, decorations, A/V equipment, displays, banners, etc. Signs, decorations and related materials may not be taped, tacked, stapled or nailed to doors, painted surfaces, columns, fabrics or decorated surfaces. Special circumstances such as use of candles can be discussed with the event planner. The Nigra Arts Center prohibits the use of glitter or confetti and asks that all helium balloons are removed by the client at the end of the event. By hosting or participating in an event at the Nigra Arts Center, the client and their guests have given permission for any photos or videos taken to be used in Nigra Arts Center publications or media, unless otherwise expressly noted in writing to the Nigra Arts Center. At the conclusion of the event, the client is responsible for dismantling and removing all event-related equipment brought into the Nigra Arts Center. There is no eating or drinking, except in designated areas. Alcohol may be served at events in the facility, provided a NYS Liquor Authority license or permit consistent with the NYS Alcohol Beverage Control Law has been issued for the event and a copy is provided to the Nigra Arts Center at least two weeks prior to the scheduled event. Smoking is prohibited in the Nigra Arts Center at all times. Smoking is only allowed in the designated areas in the parking lot adjacent to the entrance. The Nigra Arts Center takes great pride in booking and configuring events catered to your wishes. In the event that there is a cancellation less than 48 hours before the scheduled event date, the deposit will not be refunded. The Nigra Arts Center offers in-house catering services for weekday meetings and conferences through Kingsboro Catering. The menu is available by request. 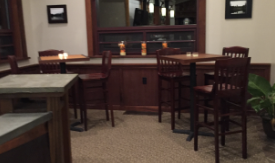 Kingsboro Catering is operated by Tim and Lori White, former owners of the Railyard Restaurant.